Directions - Located 118km from the International Airport & 116km from the capital city - Colombo, The Swiss Residence in Kandy, is on the steep Bahirwakanda hill. Kandy in general known as ‘Kanda Udarata’ (hill country) it is no wonder The Swiss Residence, set on this sharp climb, gains the advantage for breath taking views and a tingling, refreshing cool evening breeze. Take advantage of the Sri Lankan Air Taxi service and reach popular destination around Sri Lanka, such as Bentota, Koggala, Dikwella, Dambulla, Kandy (Polgolla and Victoria), Nuwara Eliya, Trincomalee, Hambantota, Tissamaharama, Castlereagh, Arugam Bay, Ampara and Iranamadu within half an hour to one hour. We have compiled a few local attractions, which you could visit leisurely on your own, or if wish could be arranged for you to visit. 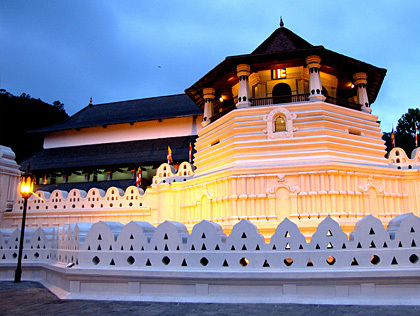 The Sri Dalada Maligawa or The Temple of the Sacred Tooth Relic is a temple in the city of Kandy in Sri Lanka. It was built within the royal palace complex which houses the only surviving relic of Buddha, a tooth, which is venerated by Buddhists. The relic has played an important role in the local politics since ancient times; it is believed that whoever holds the relic holds the governance of the country, which caused the ancient kings to protect it with great effort. Kandy was the capital of the Sinhalese Kings from 1592 to 1815, fortified by the terrain of the mountains and the difficult approach. The city is a world heritage site declared by UNESCO, in part due to the temple. Monks of the two chapters of Malwatte and Asgiriya conduct daily ritual worship in the inner chamber of the temple, in annual rotation. They conduct these services three times a day: at dawn, at noon and in the evening. A lovely centre piece to the town. 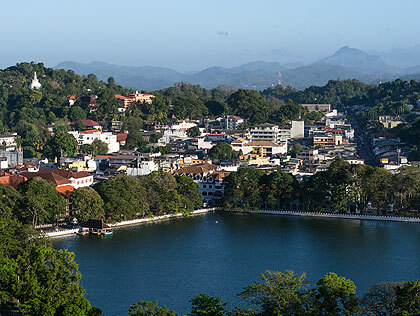 Kandy Lake was created in 1807 by Sri Wickrama Rajasingha, the last ruler of the kingdom of Kandy. Several small-scale local chiefs, who protested because their people objected to labouring on the project, were put to death at stakes in the lake bed. The island in the centre was used as Sri Wickrama Rajsingha's personal harem, to which he crossed on a barge. Later the British used it as an ammunition store and added the fortress style parapet around the perimeter of the lake. On the south shore, in front of the Malwatte Vihara, there's a circular enclosure which is the monk's bathhouse. The Royal Botanical Gardens in Peradeniya is located in close proximity to the city of Kandy in the Central Province of Sri Lanka. It is renowned for its collection of more than 300 varieties of Orchids, spices, medicinal plants and palms trees. The total land extent of the botanical gardens is 147 acres, 460 Meters above sea level with a 200 day annual rain fall, it is managed by the Division of National Botanic Gardens of the Department of Agriculture. 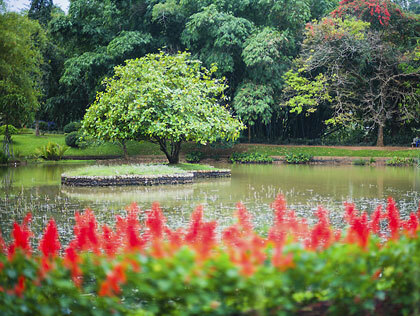 The origins of the Botanic Gardens dates as far back as 1371 when King Wickramabahu III ascended the thrown and kept court at Peradeniya near Mahaweli river. This was followed by King Kirthi Sri and King Rajadhi Rajasinghe. A temple was built on this location by King Wimala Dhamma but it was destroyed by the British when they were given control over the Kandyan Kingdom. There after the ground work for a Botanical Garden were formed by Mr Alexandar Moon in 1821. The Gadaladeniya temple situated at Pilimatalawa on the Kandy-Colombo Road is built almost exclusively out of stone in 1344 by the Gampola King Wickramabahu, situated on a hilltop, commanding views of the surrounding countryside. The architecture is Dravidian. The entrance porch features large stone pillars, which support a roof of huge stone slabs. Within the vihara, an ancient stone and plaster image of the Buddha looks down upon milk rice pots that have collected food offerings for centuries. The 638-year-Old jack wood doors still exhibit their original paintings. Built on a rocky outcrop, this 13th century temple is reached by a long series of steps cut directly into the rock. A cruciform brick building in three storeys, the Lankathilaka Temple in Kandy has an exclusive architectural design. The temple is full of exquisite painted scenes of the lives of 24 former Buddhas and there is a colossal seated image of the Buddha. At the entrance of the building there are two huge pillars. Presently the pillars have broken down and reduced to a height of 58 ft. Initially, the height of these pillars was almost twice the existing one. In the shrine rooms of the Lankathilaka Viharaya, Kandy there is an intricate designing of stonework and also of wood for the four gods who are guarding the building. 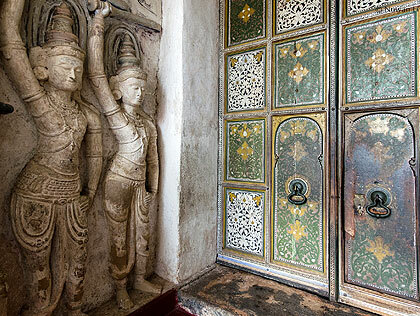 The outer walls of Lankathilaka Viharaya are adorned with sculpture which is very delicate in nature. The sculpture portrays diverse buildings of the Polonnaruwa period. There is a pillared "mandapaya" rite in front of the structure. It consists of 40 festooned pillars made purely out of stone. Embekke Devalaya, Kandy comprises carved wooden pillars with engravings of swans, lions, bulls, elephants and other such animals. On these pillars you will often find motifs like leaves, flowers, soldiers, dancing women and even mermaids. There are a total of 128 carvings on these pillars. Most of these carvings are presumably the work of the ancient artisan, Devendra Mulachari. 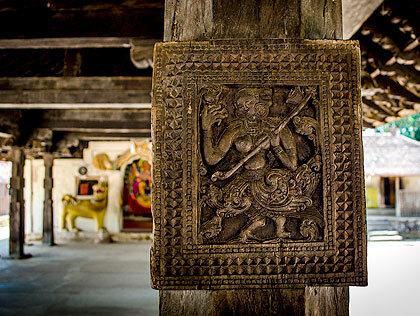 16 wooden pillars adorn the entrance of the Embekke Devalaya in Kandy. The ‘digge’ inside the Embekke Devalaya, Kandy is 52 feet, 10 inches long and 25 feet, 9 inches wide. UNESCO has accredited the site as the abode of rare specimens of fine wooden carvings in the world. The Elephant Orphanage in Pinnawale is situated northwest of the town of Kegalle, halfway between the capital Colombo and the ancient royal residence Kandy, in the hills of central Sri Lanka. It was established in 1975 by the Sri Lanka wildlife department in a 25 acre coconut property near the Maha Oya river. The orphanage was originally founded in order to afford care and protection to the many orphaned elephants found in the jungle. As of 2003, there were 65 elephants. In 1978 the orphanage was taken over by the National Zoological Gardens from the Department of Wildlife and a captive breeding program was launched in 1982. 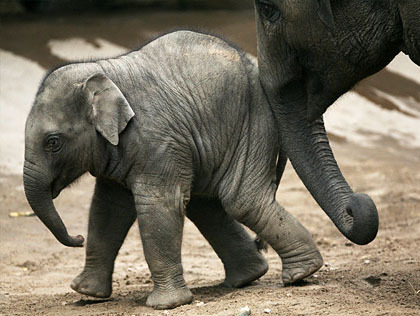 Since this time, over twenty elephants have been born. The aim of the orphanage is to simulate the natural world. However, there are some exceptions: the elephants are taken to the river twice daily for a bath, and all the babies under three years of age are still bottle fed by the mahouts and volunteers. Each animal is also given around 76kg of green matter a day and around 2kg from a food bag containing rice bran and maize. They get access to water twice a day, from the river. Udawattakele sanctuary in Kandy is recognized as the "Royal Forest Park" and has great connection with the Kings and Queens of Kandy. 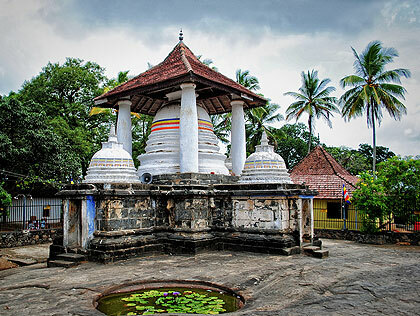 The history of this sanctuary can be traced back to the 2nd century AD at the time Kandy was governed by King Gajaba. Udawattakele and the present day Kandy was wasteland during that period. A person named Senkada was the first one to consider that this region can be turned into area where people can live. King Wickramabahu III built his palace in the wet, evergreen forest close by. 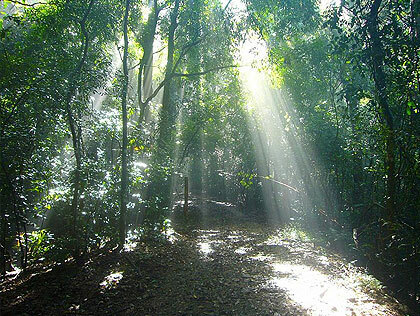 He gave a name to this forest known as "Udawasalawatta" which means the "upper front of the garden". He maintained that this could be used only by the royal family. Udawasalawatta was appreciated for its beauty and peacefulness as well as for a huge bathing pond. During the reign of the Kings, the forest was the only place from where one could get firewood for the castle and for the daily needs of the people residing in the adjoining areas. As a result it led to the deforestation of "Udawasalawatta". Its name describes its outline. 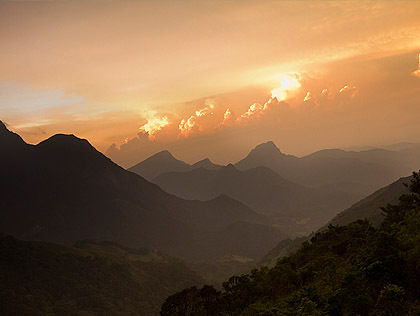 The Knuckles Range consists of the Knuckles massif, the Knuckles range and the Knuckles peaks. The Knuckles massif is about 90 square miles in extent and is a detached block of the central highlands separated from the main highlands by the the Dumbara Valley. There are 35 peaks rising to more than 3000 feet (915 m) in the Knuckles range. It has a rich variety of plant and animal life. Mammals include leopards, sambhur, mouse deer, barking deer, sloth deer, leaf monkeys, toque monkeys, wild squirrels, giant squirrels, wild boar & otter. Besides these, many species of amphibians, reptiles, butterflies, spiders, fish and birds can be found here.